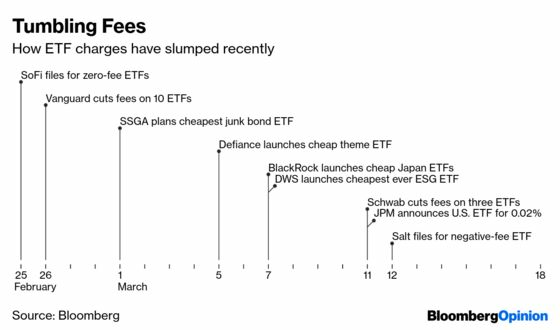 (Bloomberg Opinion) -- The fee war gripping the market for exchange-traded funds has seemingly entered silly season, with one firm just announcing a plan to slash costs below zero. To be clear, this is no joke. I can’t recall a more fast-moving, violent outbreak in the ETF fee wars as we’ve seen in the past few weeks. About 10 different issuers cut or undercut costs on about two dozen products with smaller issuers such as Social Finance and Salt Financial taking fees down to zero or below. Big firms such as BlackRock, Vanguard and State Street keeping grinding their fees lower while undercutting with new products. This relentless cost-cutting may appear self-defeating, but it works. Flows have shown to be highly responsive to even one or two basis points of cost savings. A good example is the iShares Core S&P 500 ETF, which slashed its fee to 0.04 percent in October 2016, becoming the cheapest S&P 500 ETF by just one basis point. Since then, the iShares ETF’s flow rate has doubled to $60 billion, leading all ETFs in flows the past three years and helping to widen its lead in assets over the formidable Vanguard S&P 500 ETF to $60 billion from about $20 billion. Cheap is where virtually all the investment dollars are flowing. 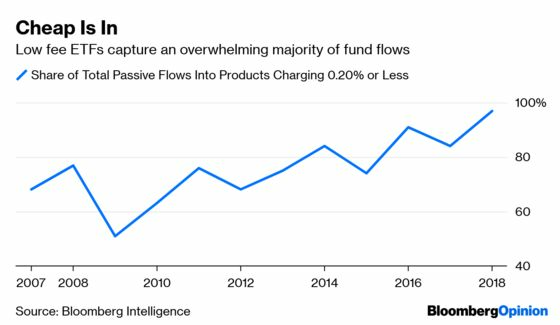 Last year, a record 97 percent of the almost $500 billion of net flows into passive funds went to products that charged 0.20 percent or less. The majority went into those charging 0.10 percent or less. This is why I frequently refer to the ETF market as a “Terrordome” that ETF issuers have to live in so investors can be satisfied. The “Invisible Hand” here is advisers. They are the closest to — and gatekeepers of — the end customer and they’ve become laser focused on fund fees, which is rational and largely done to help clients, but can be taken to extremes. Expense ratios have become the new past performance chart thanks to a shift toward a fee-only model, where the advisers get paid as a percent of client assets, and away from commissions paid by mutual funds. This Invisible Hand is why life is often nasty, brutish and short for new ETFs. This nasty environment explains why a new issuer may be inclined to offer a “negative fee” ETF, which is really just a temporary rebate to compensate new investors for the wider trading spreads of a new fund until it gets big enough to meet the asset thresholds required by many advisers. Yes, it sounds gimmicky along the lines of “free steak knives,” but it also isn’t that different to, say, a magazine publisher offering a free month’s subscription. The ETF market is so brutal that it tends to humble even the biggest traditional mutual fund companies, who come from a world protected by big asset bases, distribution fees and defined contribution plans. New ETFs from some of the deepest pocketed mutual fund firms have been rejected by advisers in favor of cheap and liquid Vanguard or iShares ETF products, which take in about 70 percent of flows. Over time, though, some of them adapt. It reminds me of the movie “Cast Away” in that they come in pampered, unable to open a coconut or start a fire but then three years later they are lean and can spear fish. No one on the asset management side — except Vanguard — is happy about this, but what can they do? They are at the mercy of advisers. While they can’t criticize advisers publicly since they are their clients and the target market for their funds, in private they complain that advisers are as motivated as much by protecting their own fee as they are by being a good fiduciary. This is why advisers may be unknowingly creating a monster in their relentless — albeit justified — focus on costs as fund companies search for alternative future revenue streams. And those 1 percent fees charged by advisers must look pretty juicy to a firm unable to sell anything charging more than 10 basis points. That’s one of the reasons we are seeing the early signs of ETF issuers getting into the adviser business both directly and indirectly. Vanguard and Schwab have low-cost advisery services and have already collected about $150 billion in short order. Meanwhile, BlackRock is getting into the game by providing the technology to advisers in an effort to drive more assets into their ETFs, which keep getting cheaper. This brings us full circle to the fee cuts. These firms — namely BlackRock, State Street, Schwab and Invesco — that actively participating in this self-mutilation ritual of cutting their own fees down to next to nothing — as well as trimming headcount and expenses - to keep up with Vanguard and satiate advisers will likely be rewarded in the future. In a bear market, the move to low-cost passive will likely accelerate. Meanwhile, the bull market subsidy that has been supporting traditional asset managers will turn into a bear market tax that puts even more downward pressure on their valuations thereby making them targets in what is likely to be an intense round of consolidation for firms with strong passive offerings, organic growth and diversified businesses. In short, these are the firms whose names will likely still be around in 10 years. They may end up having the last laugh. After announcing its fee cut to .03 percent, which is one basis point cheaper than iShares Core S&P 500 ETF,the Vanguard S&P 500 ETF took in a record $4.3 billion in a week, which shot it to the top spot overall in year-to-date flows. This is why some have argued that the adviser’s fee should be added to the ETF fee when considering ETFs versus mutual funds, since mutual fund fees includethe intermediary fee. Vanguard’s Advisor Service is mostly Vanguard’s fund investors. Still,those are wealthy investors who may have used an outside adviser and the service is open and likely to grow its outside clients.